Why is it important to the children’s home? OFW is shorthand for overseas foreign worker. These are people who go overseas and work to support the family back home. Some of the children we help have both parents working overseas and supporting or helping support not only parents and children but often also brothers and sisters. This is not only because they can get better paying jobs, but also in quite a few cases, work is not available to them at home. Many of the sailors on board cargo and cruise ships are from the Philippines. Many of the girls and women work as maids, housekeeping, and nurses around the world. They work under contracts that are often 1 or 2 years in length. These children will generally be able to see the working parent for 1 week a year or 2 weeks every 2 years. However, it is not uncommon for the OFW to go longer between visits home. This is not uncommonly due to the perception that they need to save money to send it home instead of spending it for their needs, wants, and desires. Inday, the lady that takes care of the children, was an OFW. At the age of 15, the agency provided her ID that showed she was older than 15 and got her a contract as a housekeeper in the Middle East. Her employer took her all over the Middle East. She was so afraid of the lady that Inday would often hide in the bathroom when it was time to eat. 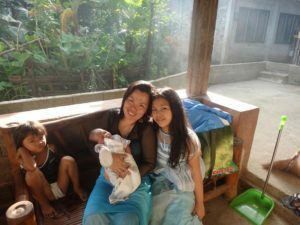 After several years, she took a couple contracts in Taiwan again as a housekeeper before returning to the Philippines to take care of her daughter instead of having her raised by her aunt. One of the very common things that the OFW workers experience is the loneliness and isolation that they feel. Families celebrate births and birthdays, sorrow in the death of a loved one, but the OFW does not get to participate. Then when they return home for their visit, much has changed because life moves on and once again, they feel left behind in family life. There is a YouTube video that is very accurate. I hope you enjoy it. The area is very similar to where the children’s home is located but the houses are much nicer than where our children live. These are the reasons that most of our children need the help that they do. Also, if you choose to share the Facebook postings when you find them interesting, it will help spread the word about our children.